We admit it! These super lemon-y, moist cupcakes aren't really for the kids - enjoy! In a large bowl whisk the eggs, sugar, yogurt, lemon zest, oil and vanilla. In a separate bowl combine the flour, baking powder and salt. Combine the 2 mixtures and scrape into 12 greased and floured muffin tins. Bake at 350 for 15-18 minutes until a tester comes out clean. Allow cupcakes to cool in pan for 10 minutes. Make the glaze: combine the 1/4 cup lemon juice and 1/4 cup sugar in a saucepan. Stir over medium heat until sugar is dissolved. Take cupcakes out of tins, poke a few holes in each with bamboo skewer and spoon glaze over top. make the icing: combine the icing sugar with 2-3 tbsp lemon juice and spread on top of each cupcake. 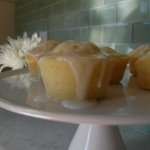 Triple Lemon Cupcakes – We admit it! These super lemon-y, moist cupcakes aren’t really for the kids – enjoy! – Plain Organic Yogurt, Sugar, Egg, Canola Oil, Lemon Zest, Pure Vanilla Extract, Unbleached Flour, Baking Powder, Salt, Sugar (Icing sugar), Lemon Juice (freshly squeezed), Sugar, – In a large bowl whisk the eggs, sugar, yogurt, lemon zest, oil and vanilla. In a separate bowl combine the flour, baking powder and salt. Combine the 2 mixtures and scrape into 12 greased and floured muffin tins. Bake at 350 for 15-18 minutes until a tester comes out clean. Allow cupcakes to cool in pan for 10 minutes. Make the glaze: combine the 1/4 cup lemon juice and 1/4 cup sugar in a saucepan. Stir over medium heat until sugar is dissolved. Take cupcakes out of tins, poke a few holes in each with bamboo skewer and spoon glaze over top. make the icing: combine the icing sugar with 2-3 tbsp lemon juice and spread on top of each cupcake.